At the very start of those industries were pioneers. Those risk taking entrepreneurs and explorers had a vision. They scraped and digged. They had a very limited vision of what they were headed to. But they did. In the late 18th century “Colonel” Drake (which was no colonel) in Pennsylvania, and the Nobel brothers in Bakou, Azerbaijan, started to dig and pump. They “stroke oil” they said. And started selling it. In 1975-76 Bill Gates and “The Steves” moved some boxes around in their garage to make space for DOS-based and Macintosh personal computers. And started selling them. For 20 years the main use for oil was… lighting, no more. Then came the explosion engine and the industrialization of car making, and it became big. Reeeaaally big…. Once the smell of easy money started to diffuse there was a boom. A rush to the most obvious takings. Everybody wanted in, everybody wanted to grab a share of this wealth that was just lying there to take. In Pennsylvania the oil deposits were no more than 100 feet below the surface. Anybody could take it! But beware. All those fields were connected below. Those who pumped faster won! Winner takes all! 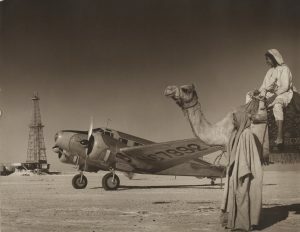 And the region had an eccentric oil boom, and it spread abroad. From California, there was a world market of people needing to buy stuff everywhere, sell stuff everywhere, advertise online, connect, communicate. But beware ! All those markets only needed one big provider for the all world. Search engine, online sales, social network… winner takes all ! And there was an eccentric tech boom, and it spread abroad. 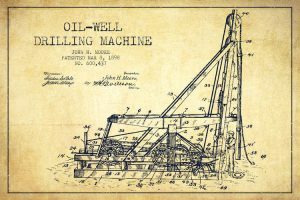 Every new oil field discovery brought a similar rush. A swarm of new actors, mostly adventurous young men, flocked in Oklahoma, Balkans, Persia, Texas, California or West Indies. Every new discovered source of tech growth brought a similar rush. May it be marketplace websites, crowdlending, artificial intelligence or cryptocurrencies, fintechs, medtechs, legaltechs, swarms of entrepreneurs, mostly moderately adventurous young men, poured in. In the midst of this rush, more intuitive leaders, poised and calm, worked to structure the industry for their profit. They created companies that expanded due to their rigorous, scientific management and ruthless methods. They watched the brawl from above and created empires, “Majors” were born. 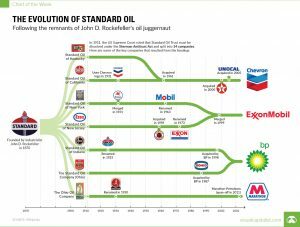 In the US, John D. Rockefeller, through a mix of strict administration, research and aggressive expansion, created a beast, the Standard Oil Company, which progressively swallowed the major part of the US market. His company invented the cracking refining technology, and acquired a huge logistic platform. It became the inevitable middlemen for the oil industry. Small time producers HAD to use the Standard Oil Company’s services. In the US, Larry Page and Sergeï Brin, created something that existed already, a web search engine. By a mix of innovative and intuitive user experience, smart business model, strict coding and aggressive expansions, in and out, they created their own beast. Google quickly became the inevitable middlemen of the all technology industry. Small time entrepreneurs HAD to use Google’s services. 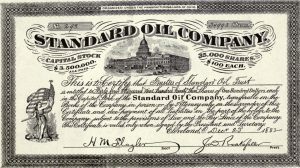 For this point forward the oil market progressively consolidated around a few major companies, Standard Oil in the US, British Petroleum, Royal Dutch Shell in Europe. They controlled everything they wanted to control. From this point forward the technology market progressively consolidated around a few majors, Google, Amazon, Apple in the US, Alibaba and Tencent in China. They now control everything they want to control. So those optimistic hot-headed entrepreneurs were left with little to dig for. They had to focus on deeper, harder, smaller and more inaccessible growth niches. They had to take bigger and bigger risks, commit bigger and bigger investments. 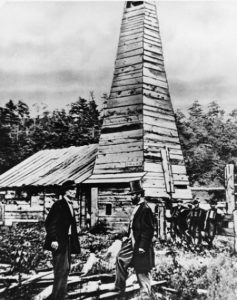 With the end of easy oil in Pennsylvania or the trusting of Bakou by local powers, exploration focus moved to other places, like Venezuela, Middle East, Alaska or offshore deposits. It became harder, more technical as just digging for a couple of hundred yards was not enough anymore. As Russia, Saudi Arabia or the OPEP started to limit access to their national deposits, geopolitics became central. With the rise of strong leaders in the main tech areas, Amazon in online sales, Google in mail, advertising and, Facebook in social networks, innovation moved to other more secluded domains or sub-niches of internet niches. It became harder and a lot more technical as just creating a website was not enough anymore. As china and other governments started to limit access to their national markets geopolitics became central. And as the majors kept getting bigger, the sole hope for oil men quickly became to be able to sell their small digging/exploration companies to one of the majors. Then started a scramble for the small & secluded fields, for a lead in a very specific field or region, in order to sell it and cash in. All new discovery brought massive interest in it as followers were desperate to finally jump in the wealth train. As the big tech majors kept getting bigger, the main hope for tech entrepreneurs became to create companies that would be attractive for a major’s buy out, the ultimate goal. All new discovery, be it AI or blockchain brought massive interest from tech followers desperate to raise massive amount of cash from VCs. Then came the deceptions. With so much money flying around and fewer and fewer easy way to capture it, imaginative scammers entered the market and harsh competition between majors and states started to slide into a mud fight. In 1979, the French oil company Elf Aquitaine sponsored a wonderful invention by Aldo Bonassoli, the “Oil sniffer”, that was supposed to be able to easily find oil fields hidden into the ground. All of it was a complete scam. The gizmo never worked. But in the meantime it swallowed over $250 millions. In 2003 Elizabeth Holmes created an amazing company, Theranos, that was supposed to be the ultimate blood sample testing unicorn. 10 years later she was indicted with massive fraud. All of it was a complete lie. Nothing never worked. But in the meantime she managed to raise over $700 millions. At one time the majors became so big, so overpowered, that politics got afraid. 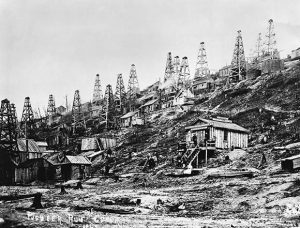 In 1911, the US engaged a procedure against Standard Oil in order to break up this monster, and succeeded. At one time the majors became so big, so overpowered, that politics got afraid. In the end of 2010s, a once small book selling company, Amazon, became globally so powerful that many started whispering about the upcoming need to break it up, to protect competition, and protect political power. Will it have the same fate as illustrious predecessors ? History does repeat itself, although it somehow always change the language. And it does because whatever changes, technologies and innovations bloom, human nature, the root of everything, never changes. And that is maybe the most important conclusion of this very awkward history of 2 industries that are not that different after all. PS : For those of you interested in the history of oil industry I would STRONGLY suggest reading The Prize – by Daniel Yergin. Pretty much all I know about oil history comes from this cornerstone book.